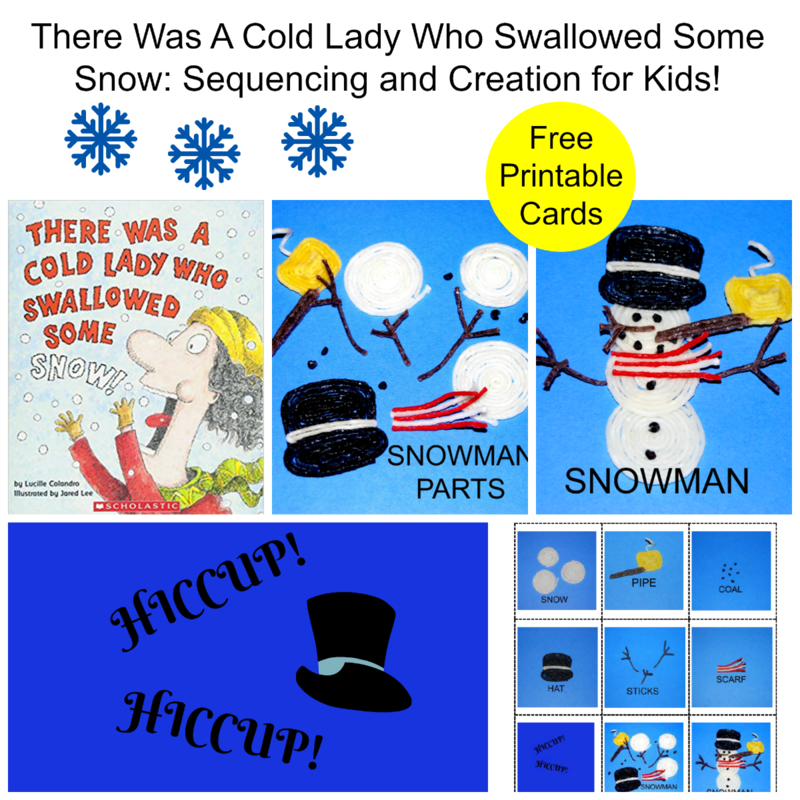 There Was A Cold Lady Who Swallowed Some Snow: Sequencing and Creation for Kids! 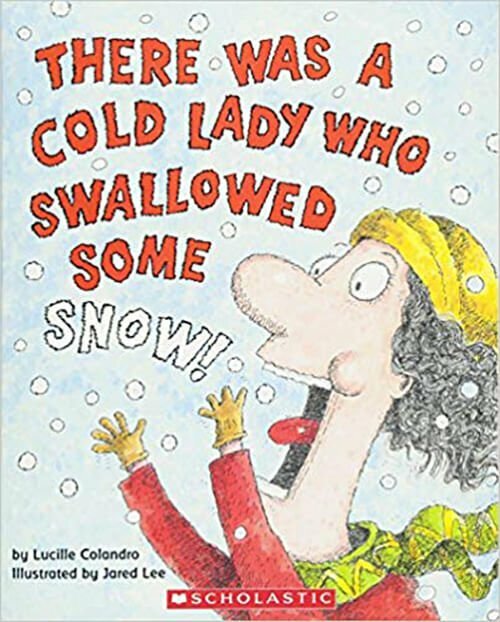 There Was An Cold Lady Who Swallowed Some Snow by Lucille Colandro is a delightful seasonal picture book for kids. The rhyme and rhythm in the book keep kids engaged while she swallows various items to make a surprise at the end. Our kids adore the old lady books; they are wonderful books for teaching sequencing through playful creation and learning. Gather your own Wikki Stix and come read, create, and sequence the book with us this winter. Free Printable Sequencing Cards – print and download here. Prior to doing the Wikki Stix snowman creation and sequencing activities, invite your kids to explore the front and back covers – ask kids what they think the book is about by looking at both covers. Read the book to your kids (older kids can read independently). Be sure to pause as each item is introduced in the story. Did your kids guess what item was created in the end of the book? Make an invitation to play by assembling all materials on a table or a large tray. Kids are naturally curious and are drawn to create and play when materials are set out. 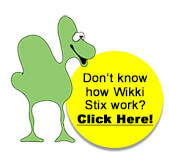 Invite your kids to use Wikki Stix to create the individual items in There Was An Old Lady Who Swallowed Some Snow. Kids will create the items according to their own ages and abilities. 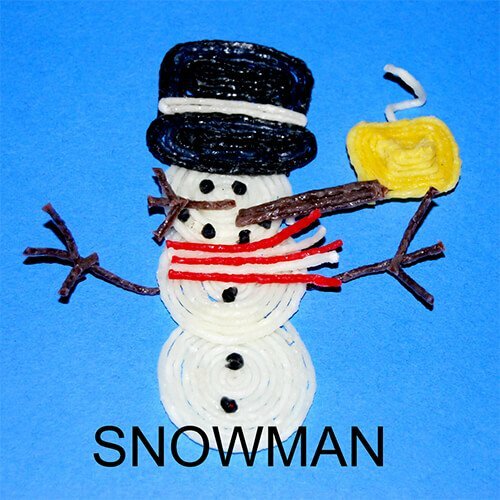 There is no wrong or right way to create the individual snowman parts with Wikki Stix. Kids should look through the picture book to see what items to create: Snow (kids will need 3 Wikki Stix spirals or white balls for the snowman), Pipe, Coal (kids can cut Wikki Stix and create tiny black balls for the eyes, mouth, and buttons for the snowman), Hat, Stick (kids will need a stick for the nose and two sticks for the snowman’s arms), and Scarf. *Note: classrooms can use the activity in small groups and ask each child to create just one part of the snowman. When all of the snowman parts are created with Wikki Stix, read the book again and ask kids to assemble their snowman in the order the items are introduced in the story. Through hands-on creation and play, kids will remember the story and learn how to sequence the events of the story. 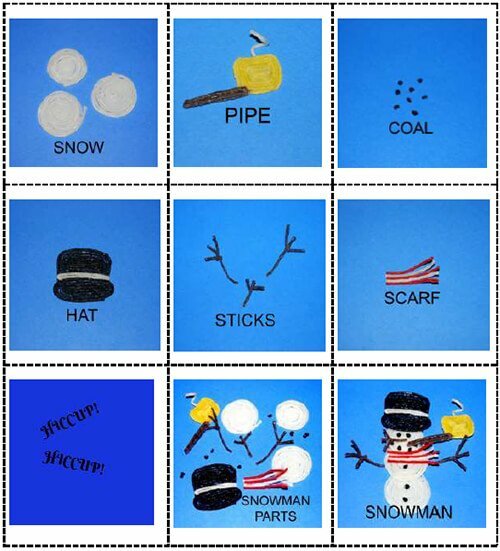 After kids have been given opportunities to create their snowman with Wikki Stix, print the free sequencing cards (linked above). Read There Was An Old Lady Who Swallowed Some Snow and ask kids to locate each item on the cards as they are introduced in the book. As kids gain confidence with the story, set the printable sequencing cards out and see if they can sequence the story independently. Use the Wikki Stix snowman parts created above to make a melted snowman project –free printable is here.